Can you identify the woman in this picture? Unidentified woman sitting on an Piper PA12 airplane. Apparently the registration number for the plane in this photo is CF-DIA that was operated by the Ontario County Flying Club, the predecessor of Oshawa Flying Club. 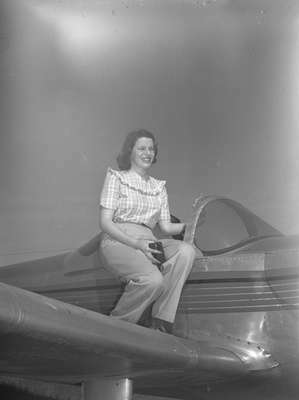 Unidentified woman sitting on a Ercoupe airplane, c.1940, Marjorie Ruddy. Whitby Archives A2013_040_1166. Scanned from a large format black and white negative.